In the past few decades, many leadership gurus came up with different definitions of leadership styles. Out of those theories, many of them are based on task – relationship characteristics. In 1938, Lewin and Lippitt proposed classifications of leaders based on how much involvement leaders placed into task and relationship needs. Almost after four decades, in 1973, Tannenbaum & Schmidt came up with a continuum of earlier studies with range of leadership behaviors, ranging from manager-centered (task) to subordinate-centered (relationship). 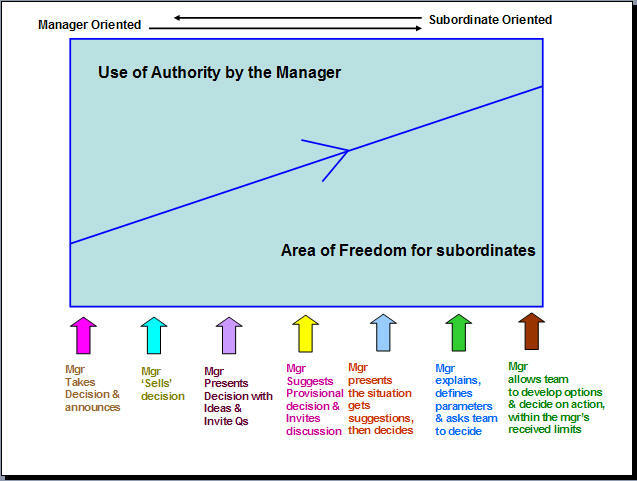 Tannenbaum and Schmidt Continuum model shows the relationship between the levels of freedom that a manager chooses to give to a team, and the level of authority used by the manager. As we already discussed in Situational leadership, number of parameters goes into choosing the managerial style: manager’s competence, subordinate’s developmental level, the situation. Based on the above parameters, level of delegation takes any one of the seven levels as depicted by the central arrow line. Tannenbaum & Schmidt concentrated more on delegation & freedom in decision making to subordinates and there by on the team development. As the team’s freedom increases, the manager’s authority decreases. This is a positive way for both teams and managers to develop. We already dealt delegating in a different blog post. 7. Manager allows team to develop options and decide on the action, within the manager’s received limit – complete freedom level; team does all the work almost as what the manager does at level 1. The main advantage of this theory: for leaders/managers – it defines the criteria for involvement and delegation & range of choices for the involvement. This entry was posted in Leadership and tagged Delegating, Leadership, Tannenbaum & Schmidt Continuum Theory. Bookmark the permalink. may you also be blessed as you telling me more things concerning this. 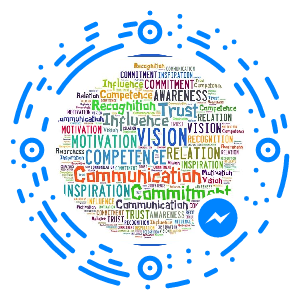 Pingback: Forming Storming Norming Performing Developmental Model | Your story is our story, let us sing together. thank you for this wonderful and practical leadership convention. i am, petrush g. macute – motivational speaker. this will help a lot of organizations. GOD bless.